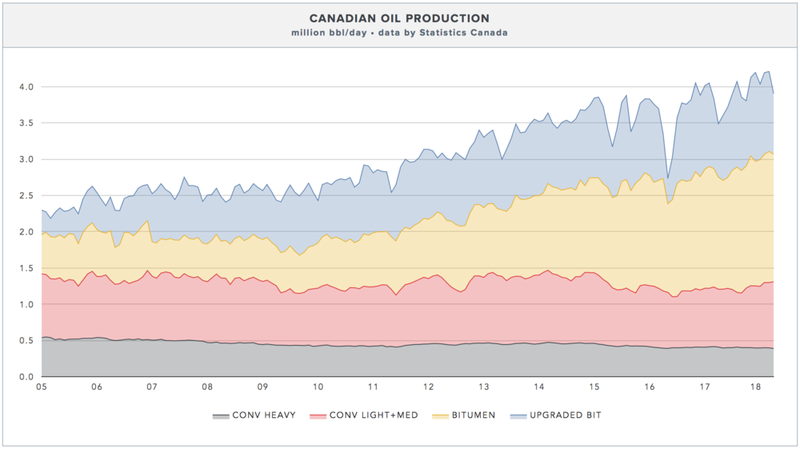 After producing a record 4.2 million bbl/day in March, Canada's total crude oil output dipped 304,000 bbl/day in April, falling to 3.9 million bbl/day (excluding condensate and NGLs). Most of the declines were seen in upgraded bitumen volumes, which fell 265,000 bbl/day for the month. The shortfall is likely attributed to Syncrude's Mildred Lake upgrader, which was offline from mid-March to mid-May. Suncor's Upgrader 1 also underwent a major maintenance turnaround at the beginning of the second quarter. Crude feed to Canadian refineries declined over 500,000 bbl/day to just 1.215 million bbl/day in April, a multi-decade low. Most of those declines were blamed on maintenance outages at Suncor's refineries in Ontario and Quebec and Shell's Scotford refinery near Edmonton. This spring saw a number of major maintenance turnarounds, including Parkland's Burnaby Refinery, which was offline through much of February and March, and Suncor's Edmonton Refinery, which also underwent a major maintenance shutdown in the second quarter. The outages have led to record or near-record gas prices in Western Canada. Canada's has a refining capacity of about 1.9 million bbl/day, with utilization rates usually hovering around 90%. On a more positive note, crude exports hit a new record high of 3.745 million bbl/day for the month, with most of those exports destined for the United States. Crude exports are now up about 1 million bbl/day from the spring of 2014. Despite much publicized constraints in export pipelines, the US Energy Information Administration (EIA) reported record imports of Canadian crude last January, estimated at 3.78 million bbl/day, including diluent volumes.